Transfer Carts are used: to carry loads along assembly lines; transfer material from one work station to the next; store and transport an entire shift worth of production. For horizontal load transfers of a wide range of material. They can even be used as a stable yet moveable machine base. With four different styles and standard capacities up to 60 tons, we have the solution you need and each style can be designed for your specific application. Basic pendant controls allow carts to travel in all directions across smooth and semi-smooth surfaces such as concrete and steel floors up to 45 tons. Ideal for assembly lines, bay-to-bay transfers, material transfers and maintenance. Rail Transfer Carts are mounted on steel rail for shuttling along a fixed path. They can be DC battery powered or AC powered. Typically used for moving materials such as steel tubes or tanks of liquids from one location to another. Standard sizes from 4 x 4 to 6 x 8. Larger cart capacities and sizes are available for specific applications. Towed Transfer Carts are not powered and are meant to be pulled or towed by another powered transfer cart or a fork lift (of adequate capacity). They are a cost effective alternative to purchasing another powered transfer cart. For on-rail applications, a winch can be used to move carts. Pull type transfer carts are versatile and can be easily customized to suit applications. Capacity Range: From 1,000 to 10,000 lbs. 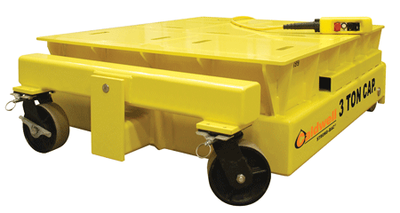 Manual Transfer Carts can be pushed or pulled by operators over smooth or semi smooth level floors. They easily maneuver loads without a fork lift. These rugged manual carts are versatile and can be customized to suit your application.